As you may have surmised, I have fun figuring out what food to make for Tapas every month. And every month I strive to outdo myself. I just have fun in the kitchen. Well, this month, I was cleaning up and found a recipe I'd clipped out of the newspaper some years ago. Never mind how many years ago, suffice to say, the paper is yellowed but not brittle, yet. Remember when we used to get the newspaper delivered every day, and then had to figure out how to dispose of that paper. No? Let me just say, if you wanted a new recipe to try, you either had to look it up in a cookbook or do like I did, with way too many recipes, cut it out of the paper or a magazine and save it to try later. Much, much, later. I found this recipe for Cantonese Style Ribs and thought that it sounded pretty darn good, so I started to make it, as per the recipe, and then, I changed it up. I can do that you know, cause I'm the cook in this kitchen. The original recipe said to brown the ribs a little and then pour the sauce over them. But I didn't do that. Drain the Pineapple, reserving the juice, set aside. Mix in the ginger and brown sugar and pour over the ribs, and cook them for three hours or until tender. Well, gee, you know darn well I didn't do that. I mixed the pineapple juice, soy sauce and brown sugar together, and tasted it. I then took the frozen ginger root I keep in the freezer and used my Microplane to add in about a tablespoon of fresh ginger to the sauce. I also chopped up a couple of garlic cloves, cause gee, garlic is good. Tasted it again, and decided it needed something more. So I added a tablespoon of Sesame Oil, and tasted it again. sigh, it still wasn't right. So I got one of those AHA moments, and added 1 1/2 tablespoons of Oyster sauce and some ketchup, about 1/4 cup. And this time it was close to the taste I thought it should have. I added in another 1 1/2 tablespoons of Oyster Sauce and another 1/4 cup ketchup and was finally satisfied with the taste. I whisked it all together and poured it over the riblets that I'd placed in a oven safe casserole dish on top of some of the pineapple slices. Cooked that off in the oven for two hours and took them out. I took the sauce that they had been cooking in and reduced it on top of the stove in a pan that I'd placed a couple more slices of pineapple in. I then poured the sauce over the riblets. They weren't quite tender enough at this point, but I wanted to get a nice brown to them, so I laid them out on a rimmed baking pan and poured the reduced sauce over top of them and let them cook for another hour in the oven. I served them with some of the sauce and a couple of slices of pineapple. And they all got eaten. Next time I make this I'll do it a little differently. And I had an adventure while taking them out of the oven, I managed to slop some of the sauce out and onto the oven door. Do you have any idea how much pineapple can muck up a door, not to mention all that sweet stuff. Now I have to clean the oven. But it was worth it. They were pretty darn good. I know cause there were a few I forgot to put out. I confess, I meant to put them out, but... I got busy with my guests and forgot they were waiting in the wings . So, till next time. These little riblets are a fun appetizer. I'm going to tell you all about attempt number 4 for my sweet and spicy wings, however that is a post for another day. Right now I have to and join my sister for breakfast and then I get to go to a real farmers market. It was our monthly Tapas Night, last night. There was standing room only again. I know cause I didn't get to sit down once. But, I had great time chatting with people, a lot of people. A few newbies, and a lot of regular attendees. However, I know you came here to find out what food was brought, go ahead, admit it. I took a lot of pictures last night, and I probably missed a dish or two, but hey, I like to visit and eat as well. I thought I would add a couple of pictures of some of the prep work. I like to figure out what goes where, or rather what foods go in which dishes beforehand and put them out, ready to go. I knew I wanted to put the cold cuts on these two plates, aren't they pretty, I got them last month from a local shop, Shop by the Sea (shameless plug here) has the most fun stuff. All kinds of collectibles and artwork. I also wanted to put out some fun potato chips for which I made a fun dip, which I will tell you about later, in a whole new post even. I wanted to put out some Chips and Salsa as well. That long green platter is one I got at Shop by the Sea as well. I love it. And I made some of my No-Knead Bread to go with the cold cuts. And now to the offerings, well, the wonderful dishes that were brought and shared. And all I can say is this, if you go home hungry, that's your problem. Cause there was something there for everyone. Also I love to see the serving dishes that people bring, I'm a sucker for a pretty dish. One of our guests brought this incredible carrot salad and was gracious enough to email me the recipe this morning. I'll be making it and sharing the how-to on it a little later on. Deviled eggs, gee, gotta have those and they usually get gobbled up, fast. I love these little rollups, always a popular item, and so easy to just pop one into the mouth and eat. Leon brought this 'Sous-vide' cooked Beef Salad. Sous-vide is a method of cooking under vacuum and you can do some incredible dishes using this process. And this salad was wonderful, the meat was as tender as you could wish and evenly cooked. Here's another shot of the salad in the foreground, with a wonderful fruit plate at the back. I should say that sometimes, it's hard to get to the table to take pictures, but I manage to get pictures of most of the dishes. Fish with an incredible sauce, I think I could have eaten the sauce just by itself, or just the fish by themselves. But together, wow. Foreground, a lovely fresh black bean salad and just behind it, some wings I made. To the left another lovely fresh salad, with corn and peas, dressed very simply with some fresh lime juice. To the right some pickles. An overview of the table, before it got too crowded. Front, an assortment of pickles, to the left going clockwise. Fresh corn salad, chips, deviled eggs, fish, carrot salad, fruit plate, sous-vide salad and rollups. From the front, going clockwise, the fish plate, the assorted potato chips, Cantonese style pork riblets I made, the carrot salad, fruit plate, sous-vide salad, beand salad, chips and salsa, deviled eggs. Rollups, pickle plate, corn salad, chips, deviled eggs, potato chips and dip, pork riblets, carrot salad, fruit plate, sous-vide. And after a few more people came, we had more additions to the table. At the right front, some puff pastry nibbles, (and I snagged one right off the bat, cause I love puff pastry, and it was good). Continuing clockwise, the black bean salad, deviled eggs, chips, egg dip, carrot salad, fruit plate, sous-vide beef salad, pickles, wings..
You think we have enough food here? I'm getting tired of typing, well not really. But I do have more pictures. There was also this wonderful hot bean dip, which was way too moreish. I got a picture of it before it got decimated. And then there was this wonderful dip/spread. Look at those cute little spreaders. I just love stuff like this. We can't have a gathering without pineapple and the Santa toothpick holder. It's just not right without them. The island (Freedom by name), was full as well, I had put out some cold cuts, along with my bread and in the back ground the bean dip. I have to say I love this island, not only do I have a dedicated prep area, it also adds some needed counter space for some of the food people bring. I made some Cantonese style Pork Riblets and they were also consumed. I'll share the recipe at a later date. I made another attempt at Sweet and Sticky wings as well. I've almost got it. But I'll keep trying. I used a new ingredient this time and of course I'll share the recipe here, but not right now. And finally, last, but not least, never least, we have desserts. Angel food cake made with Pineapple. I managed to snag a slice. And chocolate cake slices, gotta have some chocolate, somewhere. Key Lime tarts, and again, look at the cool platter. I think I need a couple platters like this, what do you think? Here's a long shot of the desserts, in the foreground, what looked to be really good bars, I say looked to be good, cause I didn't get a chance to taste them, they were gone when I finally made my way over to the dessert table. They're the fun layered ones made with saltines as a base and chocolate on top. Back of them are the tarts, chocolate cake and angel food cake. Key Lime pie, and it's a good thing I got this picture, cause when I looked again, there was none left. And there you have it. Another Tapas Night of fun, food and feasting. (I just had to do the alliteration). Post number 400, WOO HOO!!!!! I cannot believe that this is my 400th post. I didn't think I had that much to say about food. Nah, that's not true, I have a lot I can say about food and cooking and life in general, and most of it is good. I like to cook, feed people and just enjoy most of the process. Cleaning up afterwards, well... I wish sometimes I had a kitchen genie who would follow along behind me,cleaning up. I wanted to say something momentous at this point but the only thing I can think of to say is this. Thank you for reading along with me, I hope you've enjoyed the recipes, and maybe even tried one or two of them along the way. As you may know, (if you've read this blog at all), I am Danish and proud of it. I may not cook a lot of Danish dishes, but when I do, I like share them with you. I love my Smorrebrod, and have shared a couple of posts with you on that, and there is more to come, I promise. As well as some other Danish recipes, such as Forloren Hare. Gotta wait for that one til it's cooler outside, and I can use my oven again. And then there is the Mexican food I love, and recreate and eat on a regular basis... As I type this I've got some Chile Verde heating up for dinner and I will of course make some home made tortillas to go with it. Well, they're home made in the sense I make them at home, but honestly, I use a mix. I've tried making them from scratch, but my DH prefers the ones from the mix. This mix Quaker Harina Preparada Para Tortillas, to be exact. the easy way. And it tastes authentic. Yeah me!!! I hope you've had fun reading about our gatherings, I host a Tapas Night once a month, and have so much fun trying out new recipes, on my friends. And of course there's Boat Club, once a month even though it is on hiatus for the summer. Well, gee, if you can't experiment on friends, who can you experiment on? Well, gotta go and finish getting ready for Tapas, I've got an idea on what I can do with some Pork Riblets I bought, now to see if it works. Thanks so much for reading along, and if you feel inclined to comment, please do so. Ever since I managed to make such a great loaf of Rye Bread last month, I've been having fun creating or rather making Smørrebrød. I've had some with Liver Pate and some lovely homemade pickled beets, which were a gift from a friend. I've made some with Tilsit and Havarti Cheese, as well as some lovely brie. And even more Leverpostej. (Liverpaste). Actually I'm showing off here. I didn't have any rye bread but did have some Rye Crisp crackers so I made do. I found some Lurkak butter on sale awhile back, and I had to buy it. Look at that lovely stuff. Honestly, I could eat it all by itself. But I didn't. I managed to find some Tilsit cheese in the 'big city' and also some Liver Pate and had a lovely lunch that particular day. But I was craving some Italiensk Salat og Skinke the other day. And since I was at the Deli anyway, to get ham for a Chef's Salad, I had the deli person slice me a couple of pieces of ham. I was going to make some Italiensk Salat to top the ham. Side note here: Growing up I wasn't all that fond of vegetables, which considering we lived on a farm and had a market garden, was really kind of funny. I loved raw veggies, but couldn't stand them when they were cooked. Well, except for this dish. Then it was all right to eat cooked veggies. The full recipe is at the end. Cook in a little salted water until tender, then add an equal amount of frozen peas. Fresh peas would be great here as well, but I don't have any. My peas come frozen in a little bag. As soon as they are cool, add just enough mayonnaise to coat them. Not too much, you don't want them all gloppy. Place in the refrigerator and let them get acquainted, privately. Top with a little of the Italiensk Salat. Garnish, or as we say in Danish, pynt det med nogen dill. I like a little parsley or dill or celery leaves on top as well, gotta make it pretty looking. I used a little dill on here today. You do eat with your eyes as well. And if you're so inclined, go ahead and make some Smørrebrød and join me. Actually, I'm in training. I get to hang out with my sibs in a couple of weeks, and I know full well that there is more Smørrebrød in my near future. I'm excited. 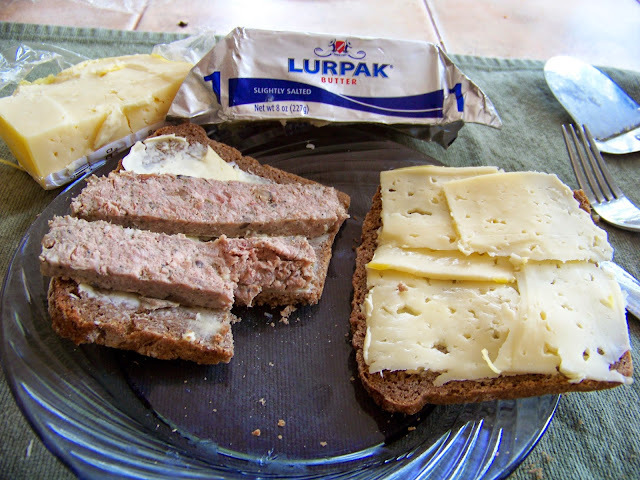 This is traditionally served as topping on open face ham sandwiches, although it can top Rullepølse or Salami as well. Cook the peas and carrots til done. Drain and set aside to cool. Place in a bowl, add the mayonnaise and mix together gently. 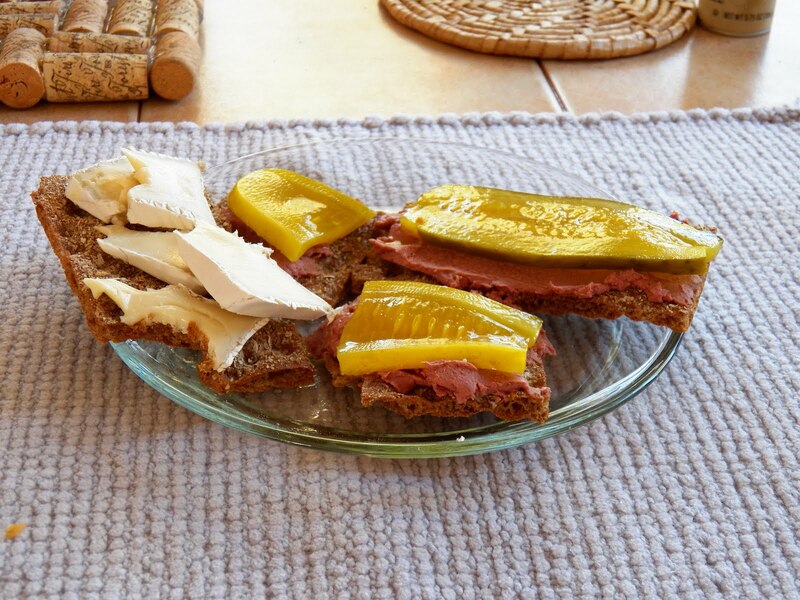 Serve a dollop on top of a piece of ham to make a Smørrebrød. Garnish with a sprig of dill or some chopped chives for decoration. For special occasions, add a couple of stalks of asparagus cooked and cut into small pieces. My cookbook Hygge - Danish Food and Recipes would be a great gift for any foodies in your life. Available as a Kindle e book or in paperback. Autographed copies are also available at the Danish Windmill in Elk Horn, Iowa or on their website. Burger Bar Bash planning tips, part two.